My wonderful wife gave me a few hours yesterday (my birthday) to finish the painting I started (but didn't finish) in my Still Life class at Fleisher. 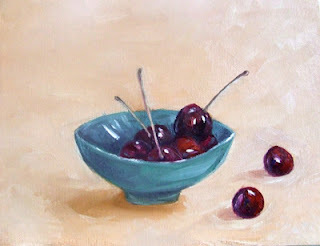 I painted the background, reworked the bowl and touched up the cherries. Oh, and I fixed the stem on the big cherry in the back and removed the stem on the one cherry outside of the bowl. I think it turned out well. I pushed myself to be more loose with my brushstrokes. I'm going to think up a few simple still life setups so I can practice that. Any thoughts? I'm signed up to take an A la Prima Still Life class at Fleisher in the Fall with Giovanni Casadei. I am so looking forward to this class and hope it helps me loosen up and look at paint application in a new way. We'll see.